Promotion and advertisements has a great effect on sales : it’s the marketing tip but same can have a good on YouTube videos and on website articles and based on my personal experience i can say that if you want to earn quickly and wanna grow quickly. you should promote your videos/articles by different ways and on different platforms. Basically how does promotion or advertisements help us to grow quickly? 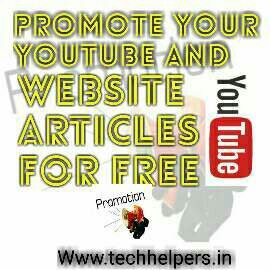 Its quite simple,when you will promote your youtube videos or website articles. it will reach to some audience and if they like it, they will subscribe your youtube channel or website mailing list. By this way when you will upload your next video or post a new article on your website,they will get notified and they will visit again and again. Most of the audience does remember your websites/YouTube channels name and they do share that also. One more thing,if you are a youtuber you should make a website and should embed your videos there and should try to use your videos as an example on that website. whereever it will be possible and if you own a website then you should make YouTube videos and should encourage your viewers to visit your website. Creating a website and YouTube channel is totally free and i have already explained those two topics in my previous articles and both does have a good impact on each other. Some platforms will be free and some are paid,i will try to explain some of them below. I myself tried this thing when i created my website and had issues with traffic. I was thinking that i will get 100% traffic from google and i got that but it was very low. So i searched a lot to get more traffic but all in vain so finally i get to know about traffup website which exchanges traffic and that is also free of cost. You have to earn points by visiting others websites and YouTube videos and after that you have to allocate/assign some points to your website. Now you should add your website/YouTube videos in traffup website/app. People will see and visit your website or YouTube videos. You have to visit others websites in order to continue your campaign on traffup website. It is totally free to share your videos and articles on social sites like facebook,twitter,google plus,reddit. Social sites are not only used for chatting purpose, Social sites are used for many purposes like exploring new topics about news,entertainment and many more but most of the guys don’t know. You can promote your YouTube videos and website articles for free on all the social sites except facebook,there you need to pay for promotion. But you can create your own page or group to have your own community and there you can promote your videos and articles for free. However it will take you a lot of time to grow there and make your own community. So if you want to grow quickly and want to earn money quickly then you should pay to promote your videos/articles. AdWords is the largest online promotional service from google and everyone know the accuracy of google. Accuracy doesn’t mean only to target right audience, accuracy means to target right audience at the right time and to track down the clicks. Because most of the persons want to earn money by doing fake clicks on ads shown on their videos or articles. so google also tracks that thing and besides everything you will get Rs 2000 additional credit to advertise via AdWords. ==> How to promote via AdWords? • Goto the website of adwords. • Now fill up your details. • Create an ad and select your bidding price,you can make it to as low as you want or as high as you want. • Now pay via debit/credit card or via net banking. ==> Note: minimum upload amount is Rs 500 for indians and minimum amount to spent on ads for a day is INR 10 RS. So your campaign will run for a long time if you select an amount of Rs 10-20 per day. Effects of AdWords: It increases your ctr and views simultaneously which any other promotional service provider doesn’t do. It targets the right audience as i already said above which helps to get more ad clicks and subscribers. I have heard of ad words before but have never used it. Thank you for highlighting ad words as I am always looking at new ways to monetize content! As a Youtuber, this post was very useful and interesting to me. Thank you. Going to look into adwords. Yay! This is a very useful post as i am about to start the venture into utube and videos. Adwords also seems like a good idea for me. This is a very helpful post. I have been thinking of starting my YouTube channel but I am just being lazy! Thank-you so much for such a helpful post! I'm always interested in different ways to monetize my blog and I'm going to look into Adwords! This is a fantastic post to help spread the word on blogs and vlogs. Thank you for compiling all of this info in one place.